Snuggled into a protected, sunny cove just over the Golden Gate Bridge from San Francisco lies Sausalito. A slim fringe of waterfront businesses and walkways faces The City, shimmering Oz-like just a few miles across The Bay. Behind are steep, wooded hills speckled with a mix of prestigious mansions and unique cottages. Pleasure boats jostle for space along busy docks. The feeling is reminiscent of many towns along the Italian Riviera. It is a warm, almost balmy, winter day in Sausalito and I am enjoying a leisurely stroll along the waterfront. Visitors pass by chatting in a dozen languages…Italian, French, Chinese, Korean…while studying café menus and window-shopping. I am drawn, like they are, to the serenity and beauty of the town and begin to read the many historical plaques along the water’s edge. This village has an interesting past. In the 19th century a boat was the only way to get here without circumnavigating the entire bay by horse and wagon. 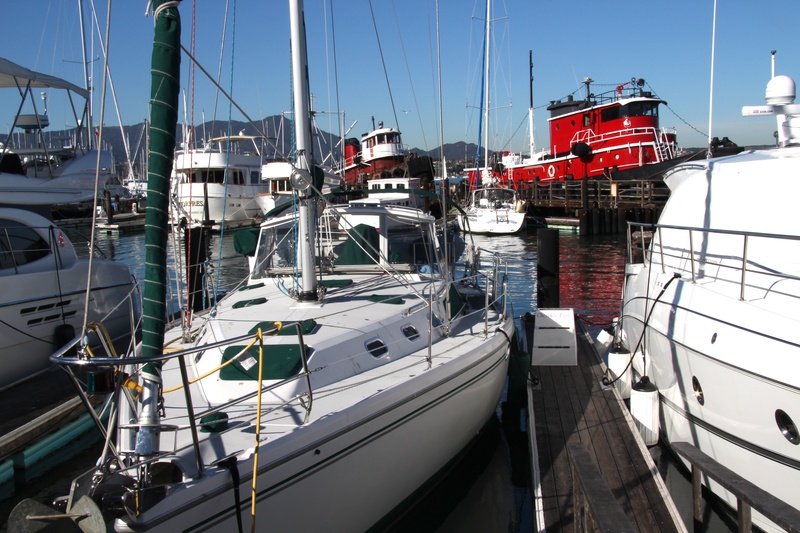 Sausalito developed piers that handled all manner of boats from cargo schooners to the traditional feluccas of Italian and Portuguese fishermen. 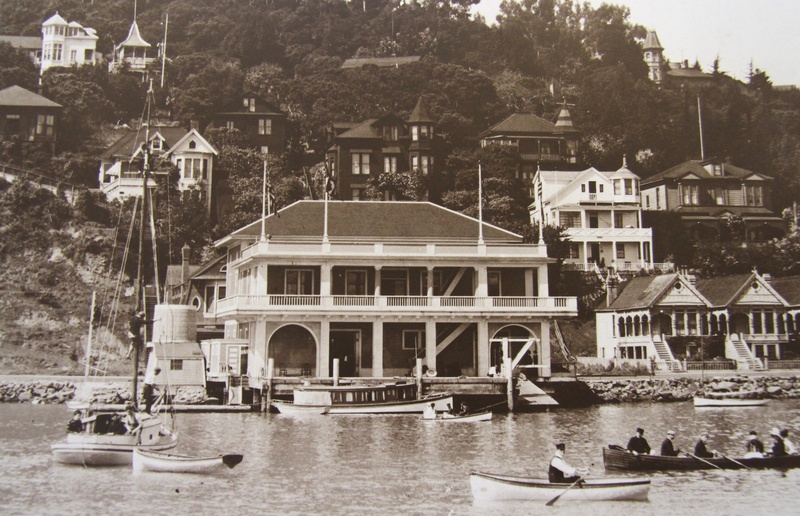 The well to do class relocated The San Francisco Yacht Club to Sausalito in 1878 and its clubhouse still stands on a pier off Front Street. By the turn of the century hillside villas and resort hotels looked down on a “fast-living” waterfront of ferryboats, saloons and gambling halls. During prohibition Sausalito’s isolated coastline and close proximity to The City made it a haven for bootleggers. Local boat builders overhauled not only government chase boats making them fast enough to catch rum- runners but also reworked the rum-runners’ boats to elude the government. By 1922 The Eureka, than the world’s largest double-ended ferryboat, carried cars from San Francisco’s Hyde Street Pier connecting U.S. Highway 101 in Sausalito. When The Golden Gate Bridge was completed in 1937 the highway bypassed Sausalito, the ferry line closed and the town quieted for a few years. The waterfront rose again with major shipbuilding for the U.S. Navy during WW2. Following the war, a lively waterside community of artists and fringe folks emerged from the abandoned shipyards. “The House Boat Wars” of the 1970’s pitted developers and hill residents against the floating community in an intense struggle that included forced removals and boat burnings. Today, three thriving houseboat communities add to the color and uniqueness of a visit to Sausalito. A passenger ferry is still a spectacular way to arrive at the pier in front of Sausalito’s 100 year old terminal building (now a hotel and boutique). 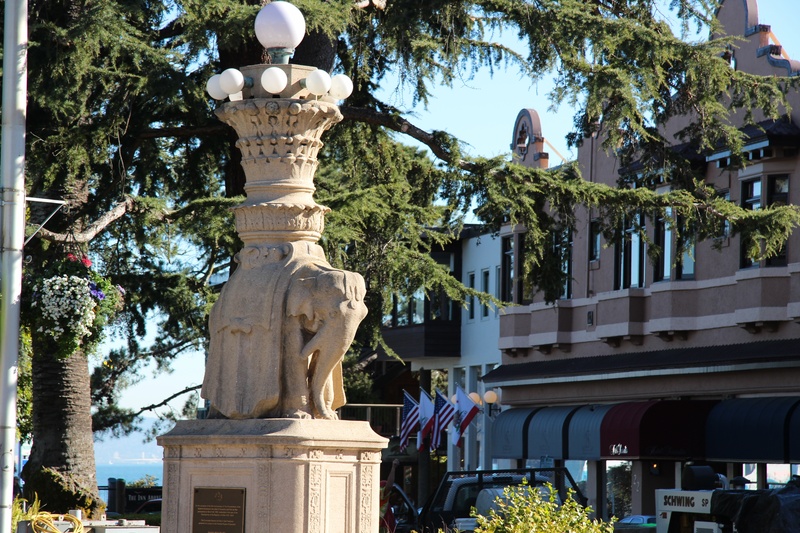 Catch a ferry at San Francisco’s Ferry Building, stroll through the tiny Vina del Mar Park with its two 1915 elephant statues and find an outdoor table at Il Poggio Trattoria. Order a glass of wine from their well chosen list, something from the wood-fired oven and watch visitors from around the world idle away an afternoon in charming Sausalito. Great article. Makes me want to stroll there soon.